Active Hands offers a bespoke service for those with limb differences or for those who do not fit one of our standard aids (size guide). If your wrist or hand measurements are outside of our ready-made measurements (size guide) made-to-measure gripping aids are available starting at a cost of 50% surcharge on top of the normal price of the aid. Contact Rob for further information or for a quote. Bespoke aids, based on our current designs, are custom made to fit your requirements. If we cannot find an existing solution for you then we can make an aid based on your measurements. The aids are priced individually depending on the number of hours work required to design and make them at a cost of £30/hour including materials and the finished product. If you are interested in a bespoke aid please contact Rob for further information or for a quote. 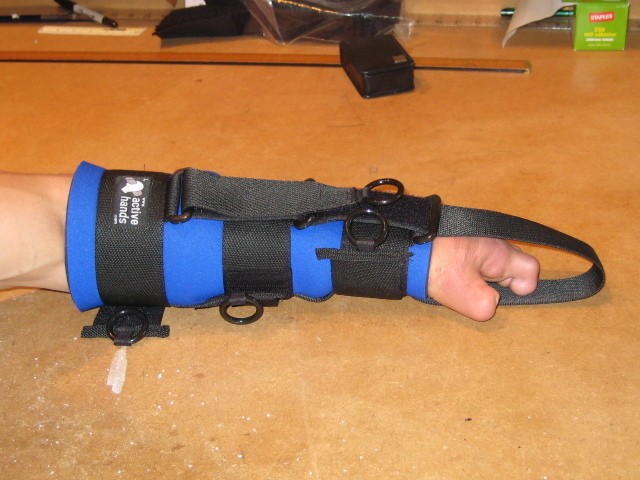 For those with limb differences, yet who have a wrist, Active Hands are currently trialling a new double strap solution that may benefit you. Please get in touch with Rob Smith for more information. The bespoke aids that we have made range from small modifications for children with tiny hands to those who need an aid designed from scratch. We have worked with Paralympians to design aids that incorporate team gloves and with those who need special attachments for their sport. Lara was born with no left hand. She has a little bit of wrist movement but no hand or fingers. 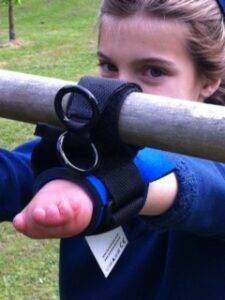 Lara’s Mum got in touch with the Active Hands design team and they created a gripping aid, based on our General Purpose aid, especially for Lara. Craig was injured whilst serving in Afghanistan. He lost both his legs, then later, in a secondary incident sustained a further accident resulting in loss of his hand. The bespoke aid needed to be weight bearing above his elbow, hence the larger design. Rufus has a limb difference that affects his right hand. 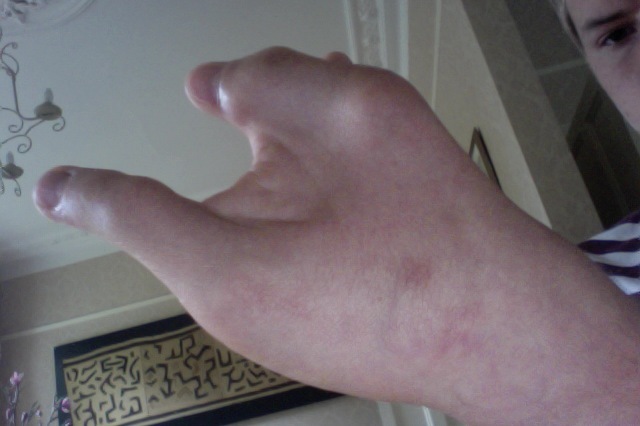 Part of his hand and his fingers did not develop in the usual way. Rufus has been helping us test out a new product designed for those with limb differences. He had tried our General Purpose gripping aid and found that, although it worked, it did not give him as much control over the handlebars as he would like. The new limb difference aid gives him more control. 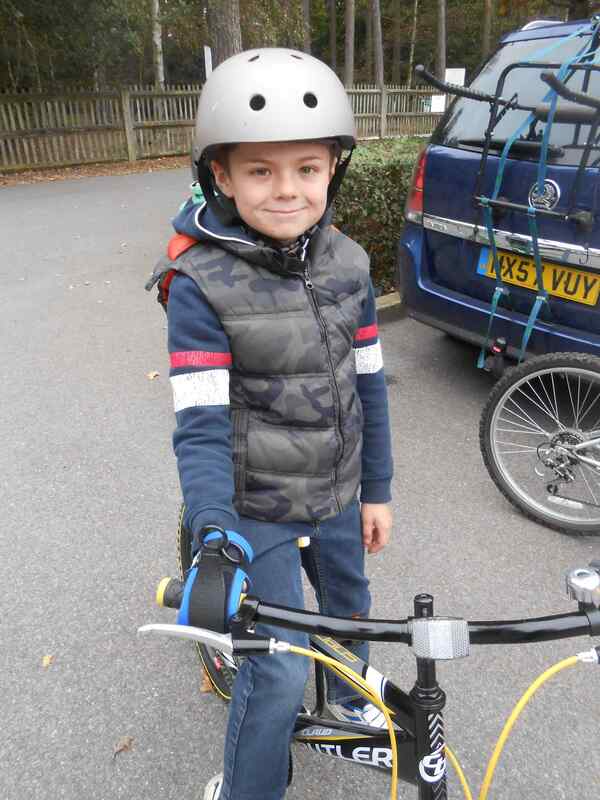 The feedback from Rufus and his Dad are helping Active Hands to get this new product right. And Rufus is pleased to be able to ride his bike! Nicky has a limb difference affecting his hand. He has a thumb and two fingers on his right hand. He wanted a gripping aid to help him to perform Olympic Lifts (a set of lifts using a bar bell). Without any device the heavy bar was resting on his bare knuckles and was not held safely. Due to his unusual hand he was not able to use one of our standard gripping aids. 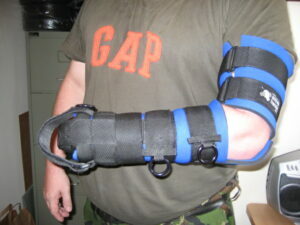 The design team created him a special aid with a twist in it to enable him to lift the weights safely and in comfort.